So I decided to share my version of I'll Be There... But this one is a little different. 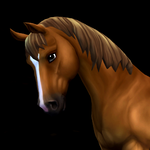 The powerful bond between you, as a Soul Rider, and your Jorvik Warmblood is a rare thing to find in Jorvik... Although the Soul Riders are close friends, your starter was there from the beginning; to guild you and help you grow! I wanted this song to demonstrate how special that bond is for not only legendary riders, but legendary guardians as well. Let me know what y'all think (unless you're tired of all these music videos)! It was fun and took longer than expected! I love it! Your editing and shots were well done and you told the story really well. One of my favs for sure.